Half a million babies are born prematurely in the United States every year. In this gripping medical narrative, Dr. Adam Wolfberg brings readers into the complex world of newborn intensive care, where brilliant but imperfect doctors do all they can to coax life into their tiny, injured patients. As a specialist in high-risk obstetrics and the father of a child born prematurely, Wolfberg explores the profound questions raised by such fragile beginnings, both from the front lines of the NICU and from his daughter’s bedside. His daughter Larissa was born weighing under two pounds, and he describes the precipitous birth at six months that left her tenuously hanging on to life in an incubator. Ultrasound had diagnosed a devastating hemorrhage in her brain that doctors reasoned would give her only a 50 percent chance of having a normal IQ. Through Larissa’s early hospital course, Wolfberg examines the limitations of newborn intensive care medicine, the science of “neuroplasticity,” and the dilemmas that surround decision making at the beginning of life. Wolfberg also takes us into the lab where researchers are working to improve the futures of children born too soon. He follows a young scientist, Jason Carmel, who was inspired to study how the brain adapts to injury when his twin brother was paralyzed in an accident. Through lucid medical reporting, Wolfberg details current scientific practices and discoveries, and explores the profound emotional and ethical issues raised by the advancing technology that allows us to save the lives of increasingly undeveloped preemies. As they make decisions about life-saving care in the first hours of a premature infant’s life, doctors and parents must grapple with profound moral and medical questions: How aggressively should doctors try to save the life of a premature baby, who will be severely neurologically and physically impaired? What might that child’s quality of life be like after millions of dollars are spent on her care? Wolfberg traces the fits and starts of the physicians, government policy makers, and lawyers who have struggled over the years to find the best way to make these wrenching decisions. 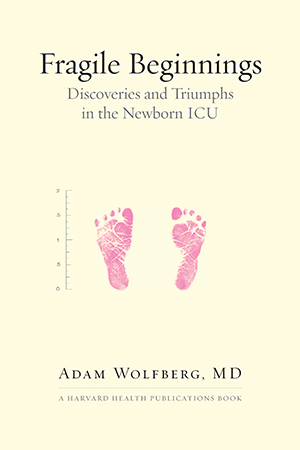 Written from Adam Wolfberg’s unique experience as a reporter, as a medical specialist and researcher, and as the father of a prematurely born daughter, Fragile Beginnings lays bare the struggles, discoveries, and triumphs of the newborn intensive care unit.
" [An] honest, heart-wrenching yet hopeful account." A vaulted ceiling rises five stories over the lobby of the Brigham and Women’s Hospital, its skylights illuminating the entrance to one of Harvard Medical School’s flagship institutions. Approximately twenty-five times every day, a small but joyous parade descends from one of the postpartum floors and crosses the two hundred feet of polished tile that stretches from the maternity wing to the hospital entrance. First comes an orderly pushing a wheelchair bearing a new mother who holds her swaddled newborn in her arms. Next comes another aide driving a cart piled high with flowers, cards, assorted baby gifts, and the usual infant paraphernalia: diapers, formula, a blanket, pacifiers. Last comes the beaming father, suitcase in hand, carrying whatever doesn’t fit on the cart. The procession pauses just before the revolving doors, and the father is dispatched to the parking garage. Soon the car pulls up, and the group moves out to the driveway; the new mother is lovingly strapped into the passenger seat and the baby carefully buckled into a car seat behind her. Quickly, luggage, gifts, and flowers are loaded, and the family drives away. This is the way childbearing is supposed to happen. Twice before, Kelly had ridden that wheelchair holding a healthy newborn. Understandably, she thought that having a child was a relatively uncomplicated affair: a couple tries to get pregnant and eventually succeeds. Nine months later, a healthy baby is born, and after a few days’ recuperation, they go home together. But after Larissa was born, Kelly rode the wheelchair across the lobby alone. Kelly steered her Ford Explorer through the slow curve as Storrow Drive swung under the Boston University Bridge and entered the stretch of highway that she liked best in the morning. Next to her, the Charles River widened, and up ahead, the sun bounced off the skyscrapers and shimmered across the ice. Behind her, three-yearold Hannah, her younger child, was cheerfully holding up her end of a conversation. Before long, they arrived at Hannah’s nursery school. Parking places were in short supply, so Kelly parked in the shopping plaza across the street. She had a long mental to-do list, and as she got Hannah out of the car, she added one more item--pick up some milk at the Stop & Shop before she left so she could get her ticket validated and exit for free. “Hold my hand, love.” They carefully crossed two lanes of Cambridge Street, squeezing into the space on the median strip between two snowbanks. There was a break in the traffic and they dashed across to the other side. Kelly had come to enjoy the daily trip into Boston. The buildings, the traffic, and the streets lined with restaurants, dry cleaners, and coffee shops gave her a dose of urban living that she sometimes missed amid the setback suburban homes in her neighborhood with clipped lawns now covered by un-mussed snow. Wrapped in layers against the January weather, they made their way to Hannah’s classroom. At first, Hannah clung to Kelly’s leg and pushed her face into Kelly’s coat. Hannah’s face emerged. She looked up at Priscilla, then at Kelly, then back at Priscilla, and started to smile. She loosened her grip. “You know it.” They chose Guess How Much I Love You off the shelves and went to the reading area with its low couches and pillows. Awkwardly, Kelly lowered herself onto the couch. “Renee, Ella, Alex, do you want to read with us” she asked some of Hannah’s friends whose parents had already departed. Ella came over and sat down. When the story about the father hare and his son was over, Hannah and Ella wandered off to the sand table. A mother dressed in a business suit came in with her son in tow. “Hi, Sarah,” said Kelly, and she couldn’t help comparing the woman’s perfectly tailored suit with the drab maternity dress from Target that she had hurriedly donned before hustling Hannah and ten-year-old Grace out the door and into the car. Between dropping Grace in front of the neighborhood elementary school and heading downtown, Kelly had managed to apply lipstick using the visor mirror, but her hair was still just hastily pulled back in a tight elastic. And then she waved a carefully manicured hand at Kelly with the apologetic look of a working mother on a tight schedule. “I know what you mean,” Kelly started to say, but Sarah was already too far away to hear. Kelly stayed and watched the kids for a few more minutes; when the children were called to circle time, she quietly slipped out of the classroom, made a quick stop at the supermarket, and headed to her car. The next stop was across town at Brigham and Women’s Hospital; she had a long prenatal appointment during which she would have a blood test for gestational diabetes, a common condition she had had during her pregnancy with Hannah. Kelly was twenty-six weeks along in her pregnancy, and she was pretty sure she’d fail the test and be required to start the restrictive diabetic diet to control her blood-sugar levels and avoid insulin injections. She smiled as she recalled her carbohydrate binge of the previous day, which she’d relished in the full knowledge that it might be her last for several months. Kelly pulled into the parking lot, checked in at the clinic, and had her first blood sample drawn. Then she drank the super-sweet cola that challenged her body’s ability to metabolize sugar and sat down to wait exactly one hour until the next blood sample was taken. She pulled a manila folder out of her bag and began to read through the information she’d printed out from the website of Boston Children’s Hospital, where she would interview the following week. Before leaving Baltimore to move to Boston, Kelly had completed the coursework for a doctorate in psychology. As a student, she had excelled at working with children who suffered from chronic diseases such as kidney failure, cerebral palsy, and severe developmental delay. She was pleased when the best children’s hospital in Baltimore had aggressively recruited her for her required one-year internship, the last thing that stood between her and her degree. But instead of taking that coveted position, Kelly had put her own career on hold and moved to Boston--so I, her former-journalist husband who had just graduated from medical school, could do my residency in obstetrics and gynecology at Harvard-affiliated Brigham and Women’s Hospital. Our plan was working perfectly--Kelly was helping our girls adjust to a new city and was pregnant with our third child during this year after our move to Boston and before her anticipated return to work. She had applied widely to internship programs in Boston and found that her success in Baltimore was opening doors in her new hometown. Leaders of the top programs in the city offered her interviews, and when the calls from internship directors eager to have her join them followed her visits to their hospitals, Kelly realized she would have her pick of jobs. A young phlebotomist with a bored look on her face called Kelly in for her second blood draw. This one hurt, as the woman missed the vein on the first jab and had to reposition the needle. Kelly went back to her reading and waited for the third blood draw, an hour later. At some point during the next hour, it occurred to her that she had not felt the baby move for some time. As the minutes ticked by, Kelly started to become anxious. Then there was a kick and a twitch as the baby shifted position. Kelly picked up her reading again, but her anxiety didn’t dissipate entirely. Perhaps it was the fact that she had been required to fast since the previous evening because of the blood test. After the third blood draw, she paged me. “Hey, what are you doing” she said, trying to sound relaxed. When she called, I’d just finished seeing a patient in the emergency room two floors below where Kelly was, so I was able to take a break. I found Kelly sitting forward in her chair trying to concentrate on the sheaf of papers in her hand. “Yes, she just moved, but something doesn’t feel right.” She didn’t look all right. “I’m sure it’s fine,” I said, still in my practiced reassuring-physician mode. “Let’s go have a look.” I took Kelly’s hand and led her through the reception area of the obstetrics clinic, past a few women who were waiting to be seen, and found an exam room that was unoccupied. Kelly climbed onto the table while I retrieved one of the portable ultrasound machines from the hallway. Then together, we looked at our baby happily ensconced in Kelly’s protuberant belly. Larissa was moving intermittently, reaching out to touch the uterine wall, then touching her tiny face with fingers that were each perfectly formed but no larger than a piece of macaroni. As we watched, she brought her legs up and then kicked, which made Kelly smile as she felt the movement we could both see on the screen. We gazed for a few minutes at our oblivious child suspended in amniotic fluid, watching her reach and turn and make the other normal movements of a developing fetus that indicate a healthy pregnancy. Kelly smiled and looked up at me. “I feel better.” The inexplicable stress that had been building since she arrived at Brigham and Women’s began to dissipate. She had her last blood draw and headed straight for the cafeteria. A few minutes later she was on her way back across town to the nursery school, eating a sandwich and listening to a National Public Radio call-in show featuring rescuers of a recent disaster. Yet somehow, inside her SUV with the heat on full blast, Kelly felt insulated from what was still raw. Early the following morning, exactly three months and two days before her April due date, Kelly was awakened by an uncomfortable sensation. It began like dull menstrual cramps, and then her lower abdomen tightened to the point of pain before slowly relaxing, leaving a hollow ache behind. This happened repeatedly, and for a long time, Kelly lay in the dark waiting for the cramps to go away, certain that this unusual sensation was just another in the catalog of pregnancy oddities. When my alarm rang, and I stumbled to the shower, she feigned sleep. Chapter 7) Is Your Life Good? Click here to read a review of Fragile Beginnings in Publishers Weekly. Click here to listen to an interview with Adam Wolfberg on NPR's Morning Edition. Click here to read Adam Wolfberg's most recent post in the Huffington Post. Click here to read a review of Fragile Beginnings on ShellyPalmer.com. Click here to read a review of Fragile Beginnings on AdventuresinJuggling.com. Click here to read a review of Fragile Beginnings on the Boston Globe's "Daily Dose". Click here to read an original essay by Adam Wolfberg on TheAtlantic.com. Click here to read a review of Fragile Beginnings on BirthingBeautifulIdeas.com. Click here to read a review of Fragile Beginnings on the blog Science and Sensibility. Click here to listen to an interview with Adam Wolfberg on WHYY's Radio Times. Click here to read a review of Fragile Beginnings on WBUR's CommonHealth blog.